Removing the stock skids are easy, but you will end up with a face full of dirt if you are working under the machine. 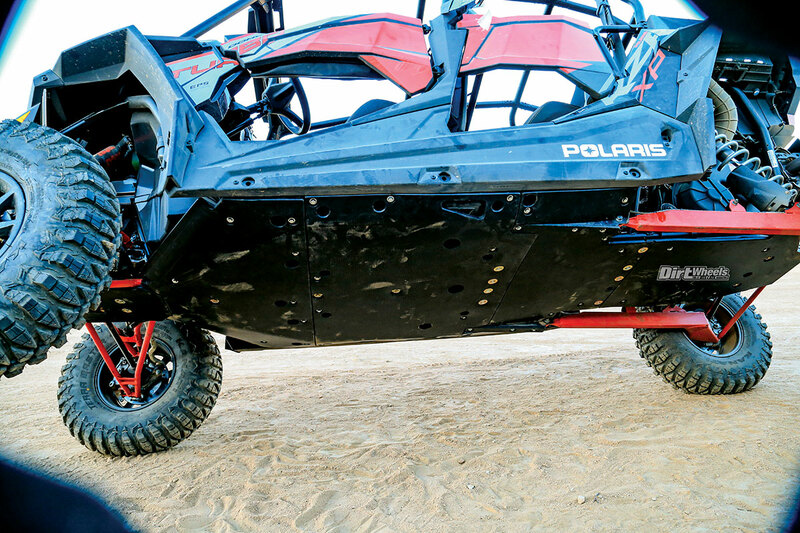 Polaris has not left the underside of its UTVs unprotected. Each has a factory plastic skid plate installed, but the plastic isn’t heavy or thick. It balances weight with maximum protection, but some people drive terrain that is a bit challenging. Ricochet Off-Road has been providing protection for off-road machinery for over 35 years. The reason? Ricochet is located right at the base of the Rocky Mountains, and there is ample reason for that “Rocky” name. For popular UTVs, you can choose between 3/16-inch aluminum for $1,149.95 (plus $80 for custom anodized colors to match your car), 1/2-inch UHMW plastic for $1,279.95 or 3/16-inch aluminum layered with 1/4-inch UHMW for $1,399.95. We have had excellent results with aluminum skid armor. It protects the underside, but also adds a tight, connected feel to the chassis. You do hear rocks pinging the surface, and it will catch a little on sharp rocks. UHMW (ultra-high molecular weight) plastic is dense, tough and slippery, and when it is a half-inch thick, it is an impressive shield for the underside of a machine—a shield that won’t dent or rust yet slides easily across rough, rocky surfaces. Even from this distance you can see the added thickness and coverage that the Ricochet skids offer. (www.ricochetoffroad.com) and click on the YouTube channel tab. Then, open the directions. Ricochet cleverly labels each section and bags the hardware for that single section separate from the other hardware. The stock skid plate segments are attached with bolts and cup washers that ensure the bolt heads hide below the surface out of harm’s way. Ricochet uses all of the stock mounting locations but supplies brand-new hardware and cup washers. The Ricochet plate is thicker, heavier and has greater coverage, so it needs additional support. That support comes from a number of clamps that go over frame tubes. Where there is not enough access, the skids have openings to insert the clamps. You are instructed to leave all of the hardware loose until all the sections are installed. Ricochet avoids drilling whenever possible, but this install requires that two holes be enlarged and two other holes be drilled. It was easy enough. All hardware is in separate bags. 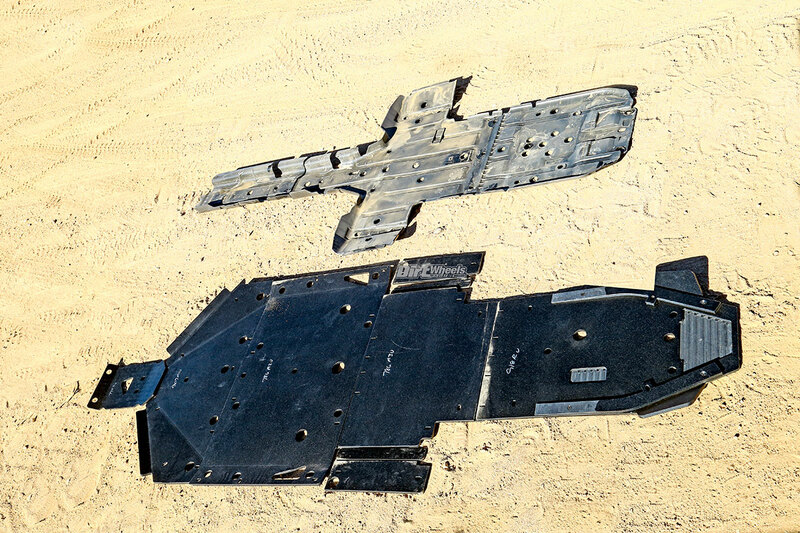 Each bag mounts only one piece of the skid armor. When we used an aluminum skid system, it was actually a bit louder than the stock skids. The Ricochet skids actually make the car quieter. After an outing with aluminum skids, we had to get under the car and re-tighten all of the hardware. That wasn’t the case with the UHMW plastic skids. We didn’t add the A-arm guards, so we were careful of the front suspension, but otherwise we were totally relaxed driving in the rough. When the skids do touch, the feeling is smooth and the underside slides right across the trail surface with no hang-ups. 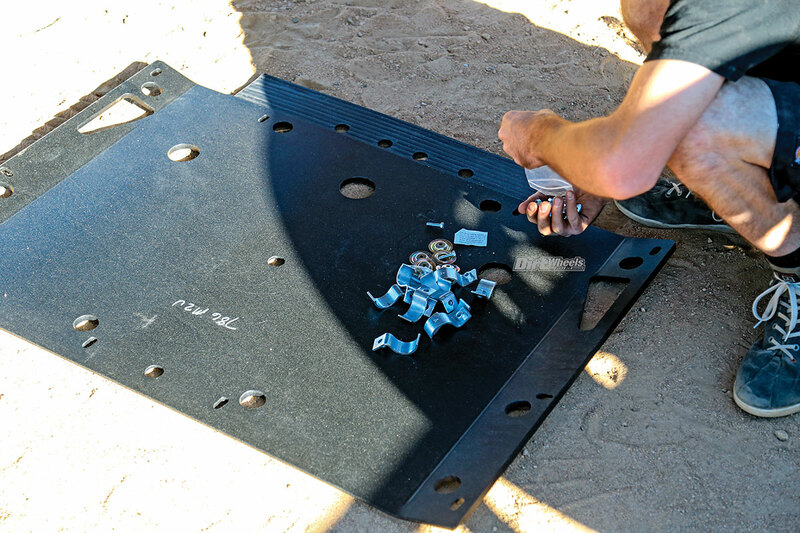 A quality skid plate system doesn’t add much bling to your machine. It basically becomes an unsung superhero protecting the vulnerable underside of your machine. The finished job with the skids installed looks great, and it leaves no part of the main undercarriage uncovered or vulnerable. The skids have all the stock openings incorporated, so you can easily do standard maintenance like oil changes. We definitely had more confidence in the rough. Despite the fact that the skids are plastic, they do require intensive machine work to make them fit together seamlessly. For some of the bling-addicted, it’s a heavy price tag for parts that are not seen, but serious off-road hounds will see the wisdom in necessary protection. For more information, visit www.ricochetoffroad.com or call (866) 273-1197.